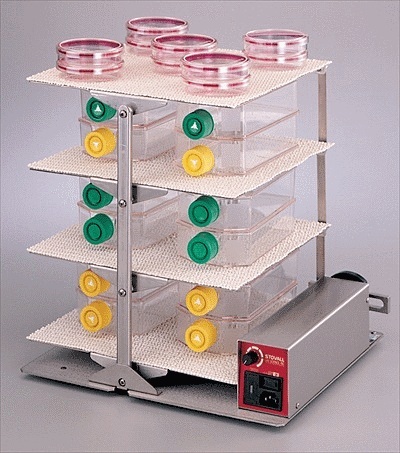 Because the motor is placed at the side this Hi-Lo Profile Rocker has a low profile and fits easily into laboratory incubators, ovens, or refrigerated units without rearranging shelves or disturbing other materials. The platform tilt is continuously adjustable from 2 to 11 degrees. The variable speed control allows running this system from 0 to 30 rpm. A maximum of 3 additional rocker platforms can be added to increase capacity while using the same amount of bench space. Variable speed control allows speeds of 0 – 22 rpm during use. With its industrial grade drive train and chemical resistant finishes this low profile roller will provide many years of great service in your lab! Gentle to robust rocking can be used in such laboratory procedures as Staining and Destaining Gels, Northern and Southern Hybridizations, Western Bloting and Rinsing Membranes, Cell Culture Incubation, and Phage Elutions or Amplification of cDNA libraries.